What the Huck? : Free Lindens? Thanks, but no thanks. Free Lindens? Thanks, but no thanks. A visit to a charming beach resort recently saw a mildly unpleasant exchange with the owner when his somethingorother script thing offered my companion free money. It was one of those random money givers you used to get all the time in the good old days of SL, when you weren't really living if your senses weren't being assailed by tat of some description on a minute-by-minute basis. And the amount was three Lindens. By my calculation, three Lindens equals approximately just over one American cent. Not even a single British penny. Let me ask you something: if a complete stranger in real life walked up to you and pressed one cent into your hands, what exactly would your reaction be? 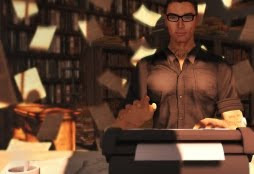 Of course, this is Second Life – not real life – and a penny buys you more in the virtual world than it does in the big outside. Why, a pair of jeans, for example, can be easily had for just two hundred Lindens – let's say the sort of jeans that might cost you $20 in real life. In this case, the 'real value' of our three Lindens rises to a staggering thirty cents! Still not very convincing in the stranger scenario, though, is it? Oh yes, in the days when we were new and still sticking to that I'm-not-going-to-spend-any-money-on-Second-Life rule; in the days when we were willing to mop floors or clean windows or do whatever other pretend task was required of camp spots (because we had no virtual friends back then to feel humiliated in front of); in the days when all we wanted was to buy a hair style that didn't look like something had melted all over our heads then we took our two or three Lindens for the half hour of our time and we were thankful. But then we discovered dignity. We decided it wasn't okay for our time to be owned so indifferently, and for such a pitifully small amount of money. In any case, by that time we'd pretty much become addicted to SL and found the funds to improve our inworld appearance elsewhere, like by cancelling our gym membership or through buying less vegetables. Camp spots, of course, were – still are, in a few persistent cases – all about attracting people to a place. The more paid avatars you could have in your venue – so the logic went – the more popular it would appear and the more people might come check it out and maybe spend some real money. In return for a trifling expenditure, you got those valuable green dots on the map and a higher ranking in search. It didn't work as a strategy because most arrivals – on seeing that a place was only filled with campers – turned around and went back the way they came. Which brings us to the random money giver: same outlay, same penny-chasing newbies, same all-important little green dots, but no camping spots whatsoever to cause us veteran SL snobs to turn up our noses and leave. Do I have a thing about random money givers? Not really. I'm pretty much neutral on the random money giver issue. I think it likely that orientation to this topic will be entirely dependent on who you are in SL and what sort of experience you've had therein. To the newbie chasing that hairstyle, it might indeed be glorious generosity. To an old hack like me, however, I can't deny that whiff, that hint, that soupçon of resentment aroused by the suspicion that someone might think I chose to visit a place just for the prospect of a measly couple of Lindens. As for my innocent companion, she hadn't encountered random money givers before, was confused as to why it had been offered and promptly returned it to the person she was told had paid it. Amongst the comments subsequently made to me by the owner was that he'd never before encountered someone with such an “attitude problem” towards receiving free money: he was actually angry that his tiny gift had been turned down. He even threatened to ban us. Is it really so unusual, so extraordinary an occurrence that someone might not consider 'free money' a significant improvement on their day? Is it really the supposition held by society that no gift of cash - no matter how small the amount, no matter how unknown the source is – should ever be turned down or questioned? In my flesh and blood life, I've turned down free things on many an occasion, as it happens. When UK supermarket Tesco briefly offered free tins of beans to its customers, for example, I didn't rush to the stores. It wasn't that I don't like beans or was suspicious of this strategy, it was simply that I didn't want to be part of a crowd who would drop everything for the sake of a few free tins of food which I didn't in any case need (I was perfectly happy with the idea that people for whom this would make a significant financial difference could stock up on the stuff unhindered by the likes of me, for whom it wouldn't). Did Tesco write to me demanding to know why their loyalty card database indicated I had not taken advantage of their generosity? They did not. It was a bizarre few minutes of interaction at the beach: for all the immense work that had gone into creating a truly beautiful sim, the owner was prepared to eject precisely the sort of customer he wanted to attract just because they declined to accept his free tin of beans. It was a reminder that business and a short temper don't go well together, and that SL is truly an odd place to be sometimes. Also, however, it was funny. As anecdote material, it's added to that sense of actually having been somewhere – like the memory of the grumpy hotelier who moaned when you checked in late and requested a sandwich five minutes before the restaurant was due to close – and increased the sense of immersion, the fairy dust that makes SL real. It occurs to me that there's the remote possibility this was actually his intent. If this is the case then I retract everything I've said above: you, sir, are a genius. Great post Huck - really enjoyed reading it. Just for your info - These days 3 Lindens do buy you a tube of infamous mosquito attracting crème. Should you go to that beach again, take the 3 Lindens and get you a tube of that. I know a nice little address for it, and it will enhance your beach experience beyond your wildest dreams. Also Huck, if you follow Phil's suggestion, you'll never have to worry about getting lost at the beach as you'll leave a trail behind wherever you go.